Central lawn of Hokkaido University. Photo taken by author. “Hokudai,” as it is affectionately known, was the first university built in Hokkaido and has one of Japan’s prettiest campuses. Domestic and international visitors alike come for photoshoots on the central lawn, in the elm forest, and along the lanes of the poplar and gingko trees. Several European-style buildings built in the Meiji era add to the unique atmosphere. Tours are provided by citizen volunteers in several languages and are a great chance to chat with locals. You can learn about the fascinating history of the university, which was instrumental in establishing large-scale farming on Hokkaido. The sprawling campus includes the historical buildings of Japan’s first experimental dairy farm. Impressive barn structures at Hokkaido University’s experimental dairy farm. Photo taken by author. Government office. Photo taken by author. Surrounded by lotus flower ponds and colorful gardens, this stately building is an architectural site to see. It served as the seat of government for eighty years and now houses exhibits on Hokkaido’s history (translations in five languages available), an archive on Sakhalin (the long thin island just north of Hokkaido) and a tourist center. It is free to enter. Entrance to Botanic Garden. Photo taken by author. If you’re into plants, herbs, and flowers, or just want to take a tranquil rest from the hubbub, The Botanic Garden is the place for you. You can easily spend two hours wandering the over 13 hectares of grounds and commuting with nearly 4,000 different plants. Trails wind through patches of preserved forest and the original buildings from when the garden was opened in 1886 remain in excellent condition. At the Museum of Northern Peoples on the grounds, you can learn about Hokkaido’s indigenous Ainu people. The garden is just around the corner from the Government Office and a short walk from Sapporo Station. Bicycle Rental Lot. Photo taken by author. Sapporo is a flat city laid out on a simple grid system with wide streets and sidewalks, making it ideal for bicycling. You can pick up your own “eki chari” bike for just 500 yen at a large lot on the west side of Sapporo Station anytime after 6 am. After filling out a simple registration form, you can choose any bike to your liking (there are plenty to choose from); each one comes with a lock. Remember to return it by midnight, and enjoy the ride! Seafood bowl with salmon eggs and sea urchin. Photo taken by author. Hokkaido boasts some of Japan’s best seafood and much of it passes through Sapporo’s Central Wholesale Market, also called the Curb Market. Located on the western side of town, it includes an outdoor market of roughly 60 storefronts and neighboring restaurants. What’s on offer depends on the season, look out for salmon eggs in October and sea urchin in summer, and of course, Hokkaido’s famous crabs nearly all-year round. If you can’t make it to the wholesale market, the Nijo Market, more centrally located near Odori Park, is also a great place to indulge in seafood fare. Odori Park in autumn. Photo taken by author. Ōdori Park is a long corridor of public space running east-west through the heart of the city. In late January–early February it is home to Sapporo’s Annual Winter Festival with its massive snow and ice sculptures. Anchored on one end by a Meiji-era courthouse, and a television tower on the other, it’s a great place to people-watch: kids romp around the play areas, families pose amid the flower gardens, and youth offer impromptu performances near the fountains. Sapporo Clock Tower. Photo taken by author. Built in 1878, the tower is known as the symbol of Sapporo and still chimes every hour. Its architectural style is borrowed straight from the American west and reflects the Meiji government’s frontier ambitions on the island. Some may recognize the tower from the movie Kita Kita, the Philippine romantic comedy filmed in Hokkaido, which became that country’s highest grossing independent film in 2017. It is just one block from Ōdori Park. Ramen. Photo taken by author. Sure, ramen is popular throughout the country, but in Sapporo the sheer variety will make you dizzy. Ramen Alley in the nightlife area of Susukino is the birthplace of the miso-based ramen soups that originated in Sapporo. The savory steam wafting into the streets promise to warm up your belly and satisfy your hunt for the perfectly chewy noodle. The Ramen Republic inside the JR Sapporo Station complex has tens of ramen shops waiting for your taste test. Japanese believe that the louder you slurp, the more delicious the noodle, so vote with your slurp! Sapporo beer is of course a worldwide brand. You can learn all about the history of beer making in Hokkaido at Sapporo’s beer museum (free tour and paid tastings). The museum is housed in an impressive former brewery from the Meiji period. You can relax, dine, and drink to your fill at the museum’s adjacent beer garden, a favorite spot for Sapporo visitors. Several beer halls offer all-you-can-drink specials and mutton barbecue, a Hokkaido specialty. Visit this factory a la theme park for a sweet afternoon of fun and love. The “white lover” cookie is a thin slice of white chocolate sandwiched between two slightly crisped baked biscuits; it is a Hokkaido classic. You can tour the factory line, design your own confections in the cookie craft studio, or expand your sweet tooth with parfaits, chocolate fondue, and full-scale cake tea sets in the cafe. Little ones can visit “kids town” and ride the cookie railway while couples stroll the rose garden. Nakajima Park. Photo taken by author. Sapporo’s sprawling urban green space has a pond with boat rides, flower patches, and picnic spots. Benches and pavilions dotted throughout the park make it an ideal spot for enjoying the autumn colors; a traditional Japanese rock garden invites those on a slow meander. The city’s astronomical observatory is at one end of the park, so you can even go star gazing at night. Since Sapporo has such a long and snow-filled winter, nearly two kilometers of contiguous tunnels connect Sapporo Station southward to the Susukino area. Everything from a full-scale mall to individual shops, restaurants, and museums is available in this underground walkway. As one Sapporo resident put it, some people can still commute in high heels during the winter! Hokkaido Jingu is the island’s most important Shinto shrine. It is located adjacent to Maruyama Park on the western edge of the city. The park is a popular spot to watch the cherry blossoms in May, and the steep hiking trail through forest that is designated as a national treasure will reward you with a vista of the city. Don’t forget to reward yourself with one of Sapporo’s best soft creams at Machimura Farm shop nearby the park. Maruyama Park hiking trail. Photo taken by author. A short jaunt from Maruyama Park is the Sapporo Olympic Museum. 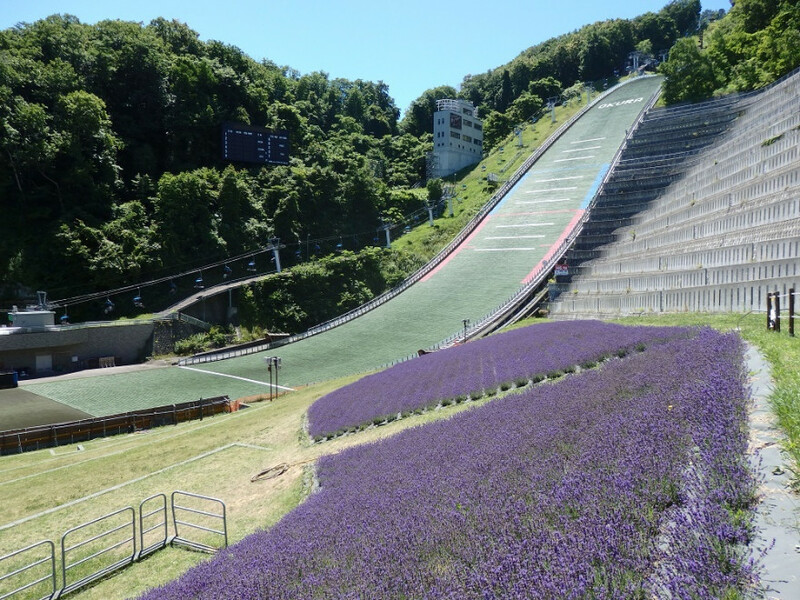 It is located at the foot of the Okurayama Ski Jump Stadium, which overlooks downtown Sapporo. In addition to learning all about the 1972 Sapporo Olympics, kids and adults alike can simulate some of winter’s most harrowing sport experiences. View from Mt. Moiwa. Photo by Hotice Hsu on Flickr. When all is said and done, ride the ropeway to the Moiwa observation deck for a panoramic night view of the city of two million and Ishikari Bay. Sapporo has been selected for having one of Japan’s most beautiful city night views alongside Nagasaki and Kobe. Take advantage of the “Welcome! Hokkaido” campaign underway now to find discounts on flight and railway tickets, accommodations, and more. For a list of services and discounts, see here or inquire with Japan’s major travel service providers, Rakuten, Jalan, and JTB.